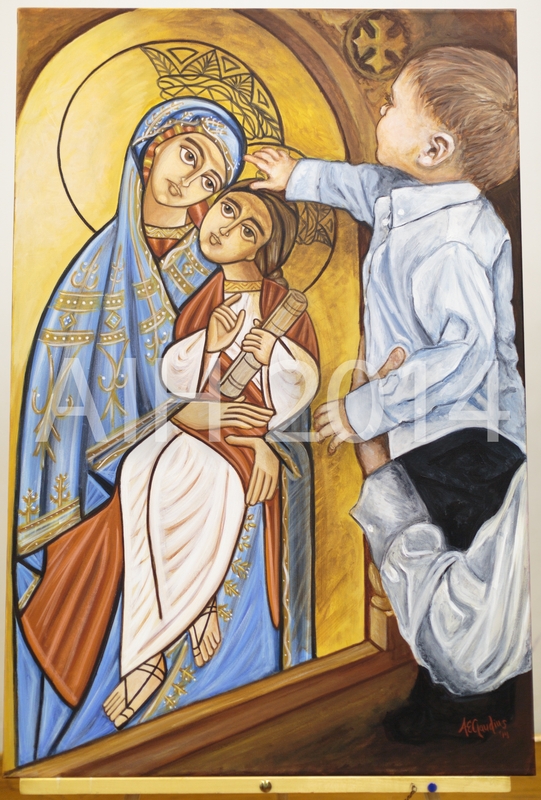 The painting, "Blessed are the pure in heart, for they shall see God" (Matt 5:8) was inspired by the many young children in church who are seen so innocently and enthusiastically approaching the icons by touching, kissing, patting, and giggling as they are held before the holy image. My own 17 month old son Moses, who is just now learning to venerate icons, and also displays these joyful gestures, was my model for the painting. Artistically, I wanted to show the contrast between two art forms- the realistic three dimensional image of the child with the intentional two dimensional image of the icon or "window to heaven." In the Pentecostal hymn, "A' Somen," we pray saying, "He made the two into one, the heaven and the earth." Therefore, spiritually, I intended to convey the connection between the victorious Church (represented by the icon) with the struggling Church (represented by the child). Furthermore, the child portrays the purity and wisdom that our Lord Jesus Christ wishes for us to attain in order to see the heavenly glory (see Matt 18:3). Although any icon represents the heavens, I intentionally chose the Theotokos, as her womb is specifically a symbol of heaven and is our connection to the Incarnate Logos.